Originally published February 16, 2012 in PQ Monthly. Queer youth have a new place to call home. 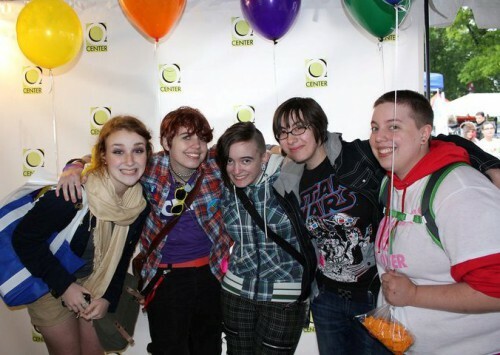 The Sexual and Gender Minority Youth Resource Center is now under the umbrella of Portland’s LGBTQ community center. Photo courtesy of Q Center. Portland’s Q Center welcomed a new family member Feb. 1 when it officially took the Sexual and Gender Minority Youth Resource Center (SMYRC) under its wing. The merger, which transfers the administration of the youth organization’s programming from Cascadia Behavioral Healthcare, promises to bolster both SMYRC’s organizational resources and Q Center’s youth programming. When talk of a merger first began over a year ago, SMYRC was in a precarious position. Cascadia Behavioral Healthcare wanted to relinquish its role as program administrator and use the building SMYRC occupied for other purposes. SMYRC responded by forming an advisory council comprised of youth and adults to explore its options. While the council considered a number of solutions — including incorporating as a 501(c) 3 non-profit — it ultimately concluded that Q Center would be the best fit. “Everyone came to the same conclusion — that this is the home where they need to land,” says Q Center executive director Barbara McCullough-Jones. Q Center is doing its best to make that landing as smooth as possible. As a result of the merger, SMYRC’s program coordinators will work full-time instead of part-time and will be joined by a third hire, thereby doubling Q Center’s full-time staff. The youth will also get a new drop-in/resource center site at 2406 NE Sandy Blvd, Suite 100, due to open by mid-March. Program coordinator Bree Abby anticipates that the benefit to SMYRC youth will extend beyond concrete additions such as staff and facilities. While most of SMYRC’s programming will take place at the Sandy Blvd. site, McCullough-Jones says that some services for older youth will be provided at Q Center, in cooperation with the We Are Here program. Between the two sites, Q Center will continue to offer the services youth have come to expect from SMYRC: a drop-in/resource center for LGBTQ youth ages 12-23, a cultural-competency training program called Bridge 13, the Washington County Pride Project, and counseling services. These offerings serve two purposes. They fulfill the specific requirements of the county grants as well as the larger mission of SMYRC. But that doesn’t mean SMYRC is limited to those goals. Ultimately, McCullough-Jones says, Q Center and SMYRC are committed to working creatively within the youth empowerment model to support the youth they serve. The active involvement of the youth is one of things that makes SMYRC so special, according to Abby. McCullough-Jones says that while Q Center tries to “err on the side of self-determination to the point where safety issues come into play,” the center is not philosophically opposed to engaging with police — a point of contention for members of the community opposed to Q Center’s cooperation with the Portland Police Bureau in the formation of Q Patrol.